Snails and slugs have caused gardeners many headaches over the years. They sneak out of their hiding places at night and chew off your plant's leaves and stalks either leaving you with a plant with its top half chopped off or leaves full of irregular shaped holes or no plant at all. They also leave slimy tracks showing where they have been. Slugs are molluscs without shells which can be between three and twenty five millimetres in length. Snails are also molluscs and the only difference between the two pests is that a snail has a shell which it carries around with it. There are various types of snails. In Cape Town we have a few different varieties. The large brown snails which we find in our gardens and which do the most damage. 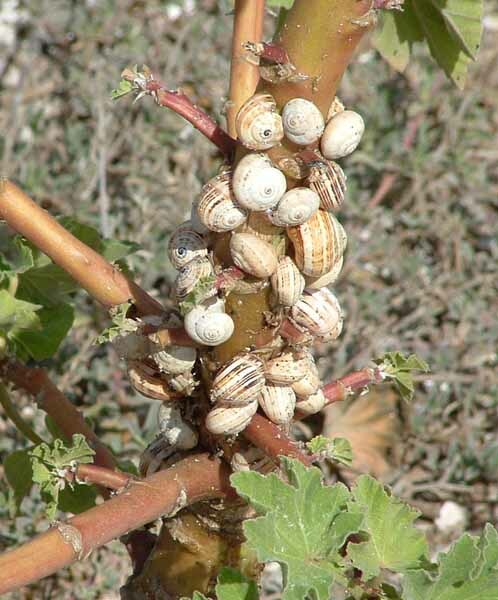 There is also a smaller grey striped snail which can be found in our gardens but these I have seen mainly on the west coast where they congregate in large numbers on bushes or grasses growing wild in the veld. The eggs of both snails and slugs can be clear, oval or round and are laid in what looks like blobs of jelly or masses in damp soil, under rocks or garden pots, or under garden rubbish. Once laid it takes between two and four weeks for the eggs to hatch and once hatched between five months and two years for the young snail or slug to reach maturity. In areas where it is very moist or there has been excessive rainfall during the rainy season you will find higher numbers of slugs and snails hatching in that year. What do these pests feed on? Slugs and snails love seedlings, young shoots, decaying plant matter, soft succulent plant tissue most of which they will find in any home garden. Being pretty mobile slugs and snails can climb trees and shrubs to get to the soft shoots which they devour. Before destroying slugs and snails should we not find out why they are on earth. Although most people can't handle the fact that snails and slugs destroy their gardens they do have some beneficial qualities. Their main task on earth is to recycle organic matter and help build up the soil. Something that is also done by the earthworms in your garden. Snails and slugs are a food source for birds, snakes, toads, small mammals and even fireflies so if we are destroying them we are cutting the food source of these animals. These days snails are even a food source for humans and can be found on many restaurant menus. Having explained their worth we find that snails and slugs are still destroying our plants in our gardens so we need to get rid of them. Below are a number of ways to get rid of snails. Collecting the snails by hand. Every morning rush out into your garden with a bucket and pick up all the snails and slugs you can find. If you want to catch the slugs then you need to go out in the evening with a torch and pick the slugs off the leaves of your plants. Once you have collected them you can do a number of things with your catch. Things such as stomping on them, putting them in a plastic packet, sealing it and putting the packet in the trash. You can also drop them in a bucket of salty water and kill them that way. The more adult snails you can remove from your garden the smaller the next year's snail problem will be. In this method we use left over or stale beer or if you want to share a beer with the snails half of yours. The beer is poured into a deepish yoghurt container (500ml) and buried so that the top of the container is level with the ground. Snails and slugs will be attracted by the beer, will crawl down into the container and hopefully fall in and drown. Check the trap daily and remove the dead slugs and snails and any other animal that might have fallen in. In this method boil some yeast and honey in water and set a trap as above in your garden. Snails and slugs will be attracted to the mixture and fall in and drown. If you have dogs and feed them dog pellets, take a handful of these and put them in a heap in the garden where the snails are giving you grief. Cover the pellets with a tin foil tray in which you have cut a few holes in the sides to allow the snails and slugs access. Weigh the foil container down with a stone and leave overnight. In the morning pick up the container and you should have a whole host of snails hiding on the inside walls of the container. Remove all the snails and reset the trap. Shade and cool places are attractions to slugs. This weakness can be used against the slugs and snails to catch them. Spread out some boards or damp newspapers, or even inverted cabbage leaves or orange peel rinds in your garden at night. The slugs will see these things as a cool shelter to hide in. In the morning you can lift up the newspaper or boards and drop all the slugs you have found under them into soapy water to kill them. Rinse and repeat nightly until the slug population is decimated. By using ordinary household ammonia you can rid your garden of slugs. Mix 600ml of ammonia into 4.5 litres of water and put the mixture into a spray bottle. At dusk when the snails and slugs become active spray the ammonia over your beds and under plant leaves where slugs might be hiding. You can also spray the ammonia under your boards and newspapers as well. The spray will kill the slugs on contact. As ammonia is a source of nitrogen your spray will also give your plants a little boost as it will act as a fertiliser. Be careful not to get the ammonia spray in your eyes. As snails and slugs have rather delicate skin and footpads they don't like crawling on rough surfaces. To protect your plants collect and dry out eggshells and then crush them and sprinkle the crushed shells around your plants. This will force the snails and slugs to look elsewhere for food. We hope that some of the ideas listed above will help you solve your snail and slug problems.